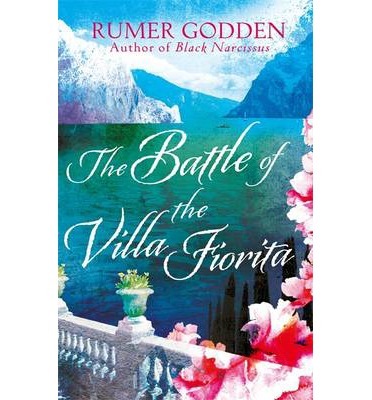 First published in 1963, Rumer Godden’s The Battle of the Villa Fiorita is the 574th entry upon the Virago Modern Classics list. The introduction to the volume has been penned by Anita Desai, who writes that the novel is ‘a display of her ability to construct a plot, quicken the pace and build up to a dramatic end’. Desai states that the novel is ‘clearly based on her own feelings over divorcing her first husband, and her awareness of both her young daughters’ and her second husband’s difficulties in accepting each other’. In her own preface, Godden reinforces this, stating that she wrote the novel because she ‘had grown tired of the innumerable novels about child victims of divorce. “Let’s have a book where the children will not be victims but fight back”‘. Financially, The Battle of the Fiorita did well, particularly in the United States, where the film rights sold for the substantial sum of $100,000. Godden goes on to say, however, that ‘no book of mine has been more unpopular, especially in America’. ‘The characters too are those we recognise from her other books,’ Desai informs us, ‘particularly the children… To some extent, it is the children who direct the action and through whose eyes we see it unfold’. The protagonists of The Battle of the Villa Fiorita are siblings Hugh and Candida Clavering – known throughout as Caddie – whose ‘seemingly perfect life’ in their grand English country home falls apart when their mother has an affair with a film director. She decides to leave the country with him, fleeing to the Villa Fiorita on Lake Garda in Italy: ‘”But it doesn’t matter where it was,” said Hugh afterwards. It might have been anywhere; it was simply a place where two opposing forces were to meet, as two armies meet on foreign soil to fight a battle’. The Battle of the Villa Fiorita opens with Hugh and Caddie’s clandestine arrival at the villa. Their father, Colonel Clavering, has been granted custody of the pair. Their elder sister Philippa is seventeen, and above such things: ‘She did not rank as a child and was going to Paris to the Sorbonne’. The children are interesting constructs, Caddie particularly; she is a daydreamer who confesses that she does not listen to anyone, and continually places her pony, Topaz, above everything else. There are, however, many character traits which Hugh and Caddie have in common with a lot of Godden’s other characters, as Desai says, so it never quite feels as though one is reading a fresh novel, or meeting original constructs. Godden is continually perceptive of how the divorce affects all involved, however; Caddie, for example, has a face ‘lumpy with distress’ and is ‘too broken with tears’. It soon becomes clear that the relationship between the children’s mother, Fanny, and her lover, Roberto, is not as happy as it should be. He continually orders her around, and treats her rather badly: ‘Rob had scarcely looked at her or spoken to her since he met her at the airport barrier’. When the children arrive, for example, he allows her ten minutes in which to see them before they go out to dinner alone. So much thought has been given to evoking the setting: ‘A path led away through the olive grove, a wide belt of rough grass and old, old trees with twisted trunks, some lichened, some split halfway up their length, showing wood dried to paleness; their roots made humps and coils in the grass but each of them had a crown of leaves, blaring now green, now silver, in the light wind’. Godden’s descriptions work well throughout: ‘The lake had never been more beautiful; it was still as a pool, its mountains dark against the sky; only their snow glimmered’. A lot of the dialogue has interestingly been woven into the prose, so one sentence often has two or three different exclamations or opinions of different characters within it. Whilst The Battle of the Villa Fiorita is interesting and relatively rich, it does not strike one as Godden’s most engaging novel, and there is nothing overly original about its plot or characters, sadly. The Fires of Autumn is essentially the prequel to Nemirovsky’s most famous work, Suite Francaise. The novel sets the historical and political scene which Suite Francaise then builds upon. The Fires of Autumn was completed in 1942, and was published posthumously in 1957, after Nemirovsky’s death in the Auschwitz concentration camp. The Fires of Autumn, the eleventh novel of Nemirovsky’s to be translated into English, is split into three separate parts, covering the period between 1912 and 1941, and following the Brun family, ‘Parisians of some small private means’. The opening scene uses a meal eaten by the whole family as its backdrop – a simple technique, but a wonderful way in which to introduce multiple characters. As with her other fiction, Nemirovsky’s descriptions are beautiful. Madame Pain, the elderly mother-in-law of patriarch Adolphe Brun, has ‘hair that looked like sea foam’, and a voice ‘as sonorous and sweet as a song’. Each member of the family is constructed of different characteristics – for instance, twenty seven-year-old Martial is ‘overly modest’ and focuses almost solely upon his studies and marrying his young cousin Therese, two of the mothers touched upon are either anxious or ambitious, and young Bernard is a dreamer, forever envisioning his future. When viewed as a familial unit, the Bruns feel realistic. Generationally, The Fires of Autumn is interesting too; each character is at a slightly different point in his or her life. The view of Paris and her suburbs is built up over time, and Nemirovsky uses all of the senses to ensure that it stands vividly in the mind of her readers. Her use of light and darkness illuminate each scene: ‘Even this dark little recess was filled with a golden mist: the sun lit up the dust particles, the kind you get in Paris in the spring, that joyful season dust that seems to be made of face powder and pollen from flowers’. Nemirovsky’s inclusion of social and political material ensures that The Fires of Autumn is historically grounded. Spanning such a long period also works in the novel’s favour. As with many of Nemirovsky’s novels, The Fires of Autumn has been translated by Sandra Smith, who has such control over the original material and renders it into a perfectly fluid and beautiful piece. She is the author of the book’s introduction too, and believes that it offers ‘a panoramic exploration of French life’. Indeed, The Fires of Autumn is a beautiful piece of writing, which encompasses many different themes and marvellously demonstrates the way in which Paris altered over several decades, and how this drastic change affected families just like the Bruns. Read as part of Fleur Fisher’s Margaret Kennedy Reading Week. Together and Apart, which has just been reissued by Vintage Books, was first published in 1936. Margaret Kennedy dedicated this, her seventh novel, to fellow author Rose Macaulay. Together and Apart begins with a letter, written from protagonist Betsy Cannon, residing in Pandy Madoc in Wales, to her mother. This technique ensures that we learn about our protagonist from the very beginning of the story, and serves to immediately announce the main thread of plot. It also wonderfully sets the scene and tone for the rest of the novel. In the letter, Betsy informs her mother that she and her husband Alec are ‘parting company’ and seeking a divorce: ‘… we have been quite miserable, both of us. We simply are unsuited to one another and unable to get on.’ She tells of the way in which she finds her husband’s writing of operettas ‘vulgar’, and does not feel that doing so is a ‘worthwhile profession for an educated man like Alec’. The pair have decided to separate for the sake of their children: ‘I now think that they would be happier if Alec and I gave up this miserable attempt… I don’t want the children to grow up with a distorted idea of marriage, got from the spectacle of parents who can’t get on’. Divorcing during the 1920s was, of course, a scandal, and Kennedy addresses this fact well in the third person narrative perspective, which she utilises for much of the book. She demonstrates the way in which the divorce affects all of those around Betsy and Alec, from their children to their outraged parents. Despite this, Betsy remains hopeful about her own future: ‘Very much happier was how she had imagined it… Of course she would marry again some time. And the other man, whoever he was, would love her better than Alec ever had, would worship and cherish her’. Kennedy discusses familial relationships and their breakdown throughout the novel, and everything which she touches upon is shown in mind of the impending divorce. Together and Apart, even all these years later, is still an important novel, just as relevant to our society today as it was upon its publication. 1. The book is far more harrowing than the film. Some of the scenes which Szpilman relates are grotesque, and really bring to life the horrors which surrounded him on a daily basis. 2. Szpilman’s lucid writing style lulls his readers in, and the way in which he has presented his story makes the horrid episodes which it relates all the more harrowing. 3. As far as World War Two memoirs go, The Pianist is amongst the most interesting which I have read to date. Szpilman brilliantly exemplifies life in the Warsaw Ghetto, and his own survival within it. 1. As everyone, I am sure, knows, I love Tove Jansson, and was so excited when I learnt that Boel Westin’s biography of her was to be translated into English. It is a hefty tome, but so much work has clearly been put into it. 2. The relatively non-chronological structure was a little confusing at times, but the thematic links between episodes in Tove’s life did work well. Sadly, the whole had not been checked as well it should have been, and many little mistakes could be found throughout the book. The translation was also not as flawless as I had expected it would be, particularly as Sort Of Books are usually so good at rendering foreign texts into careful English. 3. The social and historical details of Tove’s life did ground her story well, and the descriptions of the places in which she made her home were well wrought. The photographs and illustrations throughout were a lovely touch, but they did not always relate to the text around them and sometimes seemed to have been placed at random. 1. Colette is one of my favourite authors, and I was very much looking forward to reading some of her autobiographical work. My interest in her life was piqued when I read the wonderful Colette’s France: Her Life, Her Loves by Jane Gilmour last year. My Mother’s House draws upon her childhood and the influence which her mother, Sido, had upon her. 2. Colette’s writing throughout is beautiful. She is candid and honest about her past, and it feels as though she wants nothing more than to share her life with her readers. 3. Each chapter is a small essay of sorts; none is connected, but the structure works very well indeed. I first watched the film version of Breakfast at Tiffany’s some years ago, and whilst I liked it, I was not immediately captivated by it. I was still so keen to read the novella, however, and was so pleased to find a beautiful Penguin edition in a secondhand bookshop in Coventry a couple of years ago. I read it almost immediately, and was thrilled to learn that the novella is so much better than the book that a comparison in the favour of the original is barely necessary. (A quick synopsis of the reasons why, for me, the book is far better than the film, however, are as follows: the entirety of the novella is lively and compelling, and to me, the characters are far more realistic on the page than on the screen. I do not feel that the film characters were made of the same stuff, as it were, as the novella’s protagonists). I was not planning to re-read Breakfast at Tiffany’s, as the story was still so vivid in my mind, but once I began to look at it once again, I could not help myself but become immersed in Capote’s words and plot. Breakfast at Tiffany’s, probably Capote’s most famous work, was published in 1958, and has remained popular ever since. It focuses upon the character Holly Golightly, whom I remembered as being such an intriguing being; feisty and unusual in her characteristics, decisions and mannerisms. The novella is told from the first person perspective of a male narrator who lives in the same apartment building as her, and is set (as I am sure everyone already knows) in New York City. A chance likeness of Holly spotted in a photograph is what prompts the narrator to tell her story. Holly is first introduced when she has forgotten – or lost – the key to her apartment, and consequently wakes the Japanese man, Mr Yunioshi, who lives on the top floor. I absolutely adore Capote’s initial description of his heroine: ‘… the ragbag colours of her boy’s hair, tawny streaks, strands of albino-blond and yellow, caught the hall light. It was a warm evening, nearly summer, and she wore a slim cool-black dress, black sandals, a pearl choker. For all her chic thinness, she had an almost breakfast-cereal air of health, a soap and lemon cleanness, a rough pink darkening in the cheeks’. She is ‘shy two months of her nineteenth birthday’. The narrator goes on to say: ‘One might have thought her a photographer’s model, perhaps a young actress, except that it was obvious, judging from her hours, she hadn’t time to be either’. At first, she seems oblivious to the existence of the narrator, only making him the focus of her frequent entrances into the apartment block without her key. He, however, learns more and more about her as the story goes on. They meet each other properly when one evening, Holly climbs up the fire escape to the narrator’s apartment on the floor above hers, in order to escape an odious man who is in her room. The characterisation in Breakfast at Tiffany’s is incredibly strong; Holly is quirky, vivacious and not afraid to speak her mind, and it is impossible to forget her in a hurry. One trusts the kindly narrator immediately. The dialogue between the two, and which encompasses some of the more minor characters in the novella too, is exemplary. Capote’s prose and the tone which he sets is utterly perfect. He brilliantly demonstrates the power of friendship in his memorable and stunning novella. This is the last post of mine and Lizzi’s Big Summer Readathon, and I have had such a fun time working on our little project. Thanks so much, Lizzi, for co-hosting this, and I hope we can focus on another author soon!